Okay I picked this up roughly 2 weeks ago, fairly an old game, and this has 5 games to make a series. I was wondering what kind of game this must be to be able to have 5 games in the series. Well, ever since I started I must say I have become an official fan of ace attorney series, and have gained tons of respect for phoenix wright. 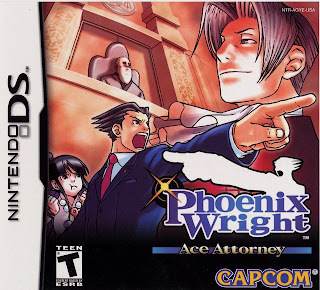 This game is one of a kind, its genre is under adventure but playing a heavily text driven game with a defense attorney on investigation is much more than an "adventure". Phoenix wright:ace attorney's story revolves around 5 cases, with the final 2 cases extremely long and satisfying. 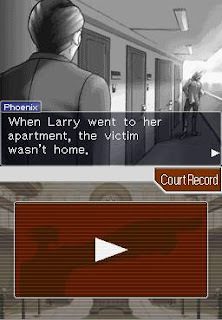 The game prolouges as phoenix wright, our main man, is a rookie defense attorney on his 1st case, bailing out his best friend. Well he gets into alot of cases,( only 5 actually) and meets people he knows and meets alot of future friends. 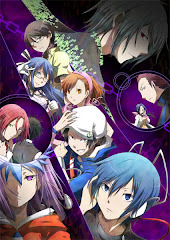 In total the 5 cases in this game may not be linked together, but the cases will get him solve murders, for his mentor, an actor, his old friend, and finally a young scientific investigator. Altough each individual case has thier own set of characters made only for that case, there are some characters that make appearances over all or several cases, and this all is rather nice to see. Normally during a case, you will do what lawyers do. But, you play the role of a defense attorney. 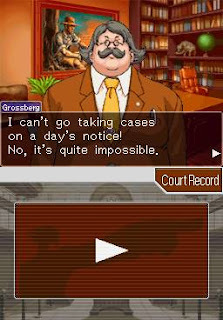 That means you are facing off against prosecutors, but in this game of 5 cases, you will be debating against 3 different prosecutors, 1 of which is an old acquantice of phoenix and will be appearing in 3 of the cases. Another is an insignificant old man and the final one is a cruel and brutal master prosecutor. So you are to declare your clients "not guilty" to win, simple? Well, not quite. The game only demands you to handle murder cases, so the game will have 2 main phases. 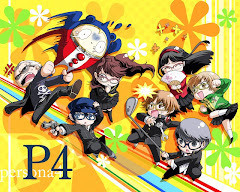 I will briefly explain phase 1, you and your partner( this may vary between 2 characters, one partner in cases 3 and 4, and 1 other partner in case 5), will go to the crime scene(s) and gather clues and evidence for the upcoming trial. Sort of like detective work eh? This can get mildly repititive if you dont know where to go and not know who to talk to, but the game always provides sufficient clues on what to do next. 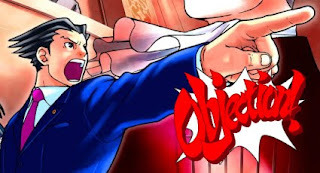 Phoenix wright:ace attorney's true gameplay value shines in the courtroom. Investigating at crime scenes for decisive pieces of evidence pay off here, you get to use them and present them to prove your client's innocence. This is the second phase of the core process of the game, having your go against the opposing prosecuter in the courtroom. All the time you find yourself listening to witness testimonies and finding contradictions in thier statements, so that you can press information out of them and eventually present and show evidence to prove thier contradictions. During such times the music plays really well and totally fits along the sudden change of text. These are the true feelings of satisfaction in this game, proving the witness wrong! And this is hell satisfying. 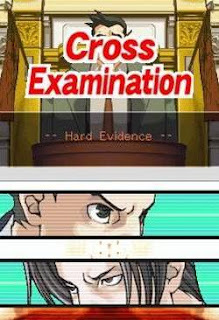 And hearing phoenix yell "OBJECTION" every time he presents neccesary evidence never feels old. With wright's rookie-ness but perfect court win record, he has on his way met many wacky incidents. Many a time during court case plays you find yourself with insufficient evidence before the court is in session, but after an insane turn of events, you find yourself emerging victorious and also getting a whole lot of information on the case. The cases at first for most of the time always points towards the suspect( usually your client) due to the crap load of evidence, but somehow, no matter how ridiculous and far fetch the real happenings turn out to be, there is always a logical explanation for what happens. That is what make the cases so unique and interesting, there is always a logical explaination for what happened, no matter how ridiculous the outcomes! Phoenix wright:ace attorney has plenty of good moments to offer. The cases are rock solid fun, and courtroom battles are always satisfying when you start uncovering the truth piece by piece. Its also great to see the prosecution's witnesses freak out when under accusation. 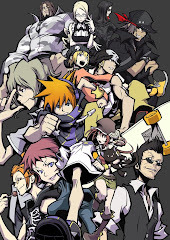 With the only flaw in this game being the incredibly inconvinient save system, where you can only save after a day of investigation(usually very long), or after court is adjourned or called into reccess, I see no reason why anyone should overlook such a brilliantly made game.